HONK if you fork has more rake than Autumn in New England! This is the bike I bought new in 1986 to take with me to Indiana University. I recall my first year on campus and carrying my bike to my third floor dormitory each night. I was not about to leave it outside any more than I had to. A few months ago I pulled it from garage and put new wheels, tires, SKS fenders and a brooks saddle on my old sprint. I still have the original rear rack and recently have taken to throwing my laptop and a few clothing items in panniers and commuted to my office (30 mile round trip). A buddy tried to talk me into a new Surly LHT but I am enjoying the pleasure of riding on my old bike and the uniqueness of many memories. That is a beautiful specimen of Schwinn goodness. Should you one day succumb to the allure of a new Surly LHT, (the new disc version does turn my head, I do confess) you can always polish the old Schwinn and take the occasional springtime ride through our old school campus. I have lived many places and l have had many lives, but my time in “The Womb” will be forever my favorite. Two nice Schwinn’s in a row and very similar in appearance, nice going Cam! 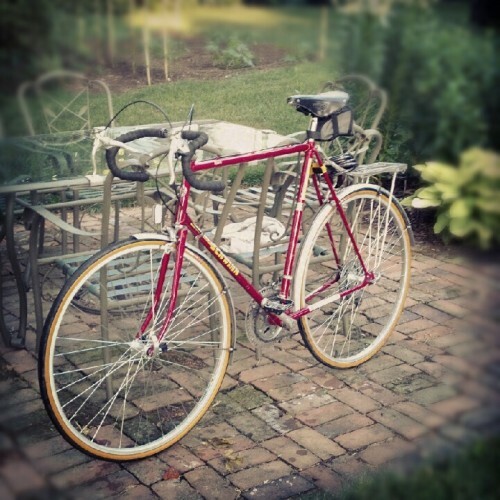 Hi- I am just now gearing up to restore my ’86 Schwinn Sprint. I have a much smaller frame, but have been concerned when it comes to installing fenders and a rear rack. It looks like you attached the back of your rack to the seat post clamp? And there was enough space to attach fenders? It looks like it would be a tight fit on mine!